Tip # 5 – Maintain your systems. Update update update. From a security perspective ensuring that workstations and servers on your network have proactive maintenance performed on a regular (weekly) basis is key. Most malicious software target security holes found within out of date programs. If the anti-virus product fails at catching malicious software (and none are 100%), the chances that it can gain a foothold in your system are greatly reduced if it cannot find a program with an un-patched program to exploit. Proactive maintenance including installing patches (security updates) to the operating system and all programs. 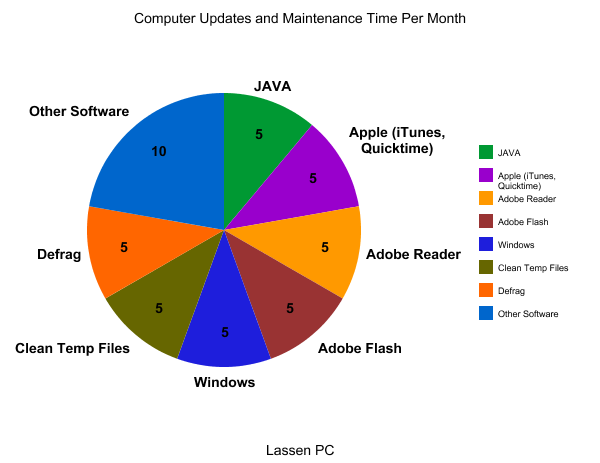 The graph above represents the average amount of time required for one person to manually maintain one computer once a month. That’s about 50 minutes per computer. But that’s not all that needs to be done in proactive maintenance. We’ll post more tomorrow in ‘Tip # 6 – Fine tooth comb’ about the rest (checking event logs, disk usage, memory usage, security logs, etc.). Departing thought for the day – is your IT provider ensuring these tasks being performed on your systems, 24/7/365? Are you sure? ← Tip # 4 – Stop using Yahoo. Just stop it. Now.